This article first was published by Seedstock.com on June 20, 2012. While bats have held starring roles in vampire films and decked many a Halloween party, their absence rather than presence could be the main storyline for the real American horror story. Each summer bats consume thousands of tons of insects that if left unchecked would devour the nation’s crops. Over the past several years, several species of American bats have come under attack from an invasive fungus responsible for a virus known as white-nose syndrome that has left bat caves littered with bodies. Biologists estimate that 6.7 million bats have died as a result of white-nose syndrome in the past five years, says Dee Ann Reeder, assistant professor of biology at Bucknell University and principle investigator at the Reeder Lab which researches diseases affecting bats. The implications of this loss are huge, she says. “For every million bats that have died, 692 tons of insects are not being eaten every summer,” she adds. 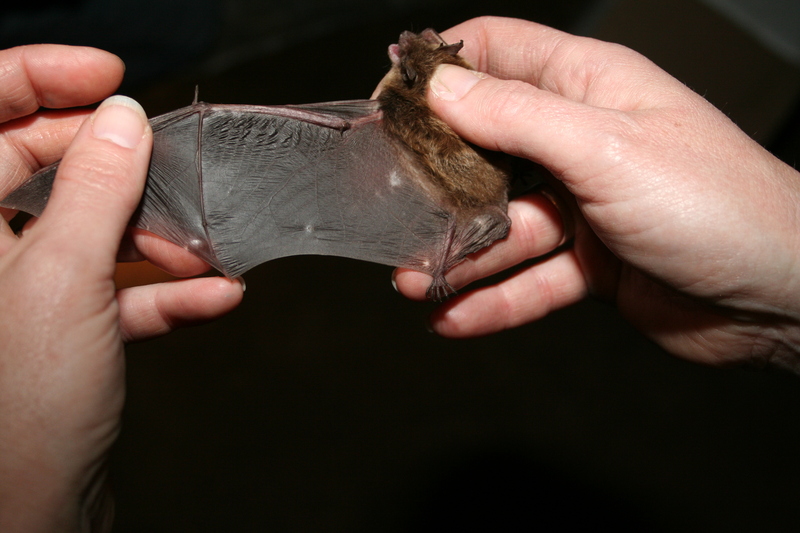 Bats perform a multibillion-dollar service for the agricultural industry. So far, the areas hit hardest by the fungus, mainly in the northeastern United States, have not been major agricultural regions. However, as the epidemic spreads further toward the Midwest and the breadbasket states, biologists and farmers are starting to worry. Geomyces destructans, the fungus that causes white-nose syndrome, originates in the caves of Europe where bats are immune to the disease. Somehow, likely on the heels of a trans-Atlantic tourist, the fungus hitched a ride to upstate New York in 2006 where bat populations had no natural defenses against the fungus, which penetrates into the bat’s wing fibers during hibernation. The fungus disturbs the bats and rouses them from their winter slumber to scratch the fungus off of their wings (this is how the telltale white fuzz gets on the bats’ muzzles). Once awake, the bats fly off in search of water using up valuable energy stores that were meant to sustain the animals throughout the winter. Eventually, most of the affected bats starve to death. Since its arrival, the epidemic has continued to spread into the south and towards the Midwest. According to the U.S. Fish and Wildlife Service, biologists have confirmed cases in Kentucky, Alabama, and Missouri. In areas frequented by both people and bats, biologists have taken particular precautions to reduce the likelihood of humans aiding in the further spread. Some caves have been closed to the public; others have instituted protocols to remove spores from visitors shoes and gear after leaving the cave. However, there are no tools to keep the bats themselves from spreading the virus, says Reeder. Her lab has been examining differences between species, asking questions such as why is the little brown bat more susceptible than the big brown bat? Does the bat’s size afford some level of protection? Others have been conducting drug treatment trials. She says that she has been working with Marcy Souza, assistant professor of veterinary medicine at the University of Tennessee, Knoxville, who developed implants to slowly release a drug similar to lamisil, a common treatment for finger and toenail fungus. Again, administration would be a challenge. This coming year, Reeder says that her lab will focus on understanding the survivors. She will try to answer the following questions: Did they hibernate in a different section of the cave that for some reason that was less hospitable for the fungus? Are they somehow physiologically equipped differently to resist the fungus? Is that trait heritable? Will natural selection be able to kick in before entire populations are wiped out? So far, the questions far outnumber the answers. Federal wildlife officials are currently weighing the possibility of attempting to maintain a captive population of bats as an insurance measure should wild populations be lost beyond recovery, says Reeder. However, she adds that most bats do not fare well in captivity. Without any means to control the virus, the agricultural industry may need to assess how to respond to the loss of the pest control provided by bats. That free service equals over $3 billion a year, according to recent study on the potential agricultural impact of bat decline conducted by researchers at Boston University, The University of Tennessee, Knoxville, and the Universty of Pretoria, South Africa. Should farmers lose this free service, they will be faced with a sobering choice: accept increased crop loss due to an uptick in pests, or find some other means of controlling insects.